Safety. Convenience. Economy. 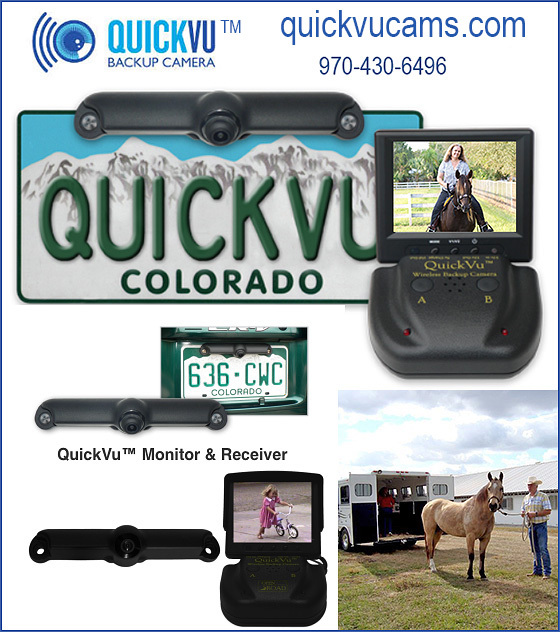 Whether hitching your horse trailer or simply backing out of the driveway- QuickVu™ Wireless Back Up Cameras has your back-- each and every time you are behind the wheel! Who Has YOUR Back When You Are Backing Up? Traveling with your horses can be challenging under the best of circumstances. Having to back up to hitch your horse trailer or back out of that space at the horse show can have the best of drivers ‘on edge.’ Anything can happen — and it does all the time. But what about less friendly circumstances: Fire, Flood, or veterinary emergency? Just a little anxiety can make the difficult almost impossible. QuickVu™ Wireless Backup Camera has your back — literally — when you are backing up or trying to hitch that trailer? It can lessen your stress and possibly even help to save your life — or the life of the horses or family you love! What Sets QuickVu™ Apart from Competitors? Unlike other so-called ‘wireless cameras,’ the all-digital QuickVu™ Wireless Backup Camera has no wires, not even for power. Installation could hardly be simpler – simply bolt it on the license plate! Then stick the QuickVu monitor on the dash and plug it into the vehicle’s power outlet, and the system is fully installed and ready to use. Everything needed is in the box, and full installation can be done in as little as five minutes. The all-digital camera provides a clear image even at longer distances behind trucks and trailers without having to route wires. You can even turn on the camera while driving in forward gears, if you need to check on the tarp on your trailer! What Situations Can I Use My QuickVu™ Wireless Back Up Camera For? The QuickVu™ Wireless Backup Camera helps anytime you need to back up your vehicle. Avoid children, pets, and property when backing out of the garage and driveway. Easily back into a parking space. Take the guess work out of parallel parking. Hitch your trailer with ease – see the trailer in the distance and back right up to the hitch. Mount the camera behind the trailer to make backing the trailer a cinch. See the shopping cart left behind your vehicle at the last minute and avoid those insurance claims! Great in an emergency when seconds count. Can I Install on My Truck and Then Switch It to My Car? Yes! The QuickVu™ Wireless Backup Camera can easily be moved to another vehicle. Because there are no wires to route, simply remove the camera from the license plate and the monitor from the dash and move them to another vehicle. So, if you sell your vehicle, the camera can stay with you – or leave it with the vehicle you are selling to increase its value! How Does QuickVu™ Know When I Am Backing Up? Actually, it doesn't, but it can make a good guess. Most of us back up most often just after we start our car (backing out of a parking space, driveway, or garage). So, when you start your car and the power outlet powers up (this is not applicable for power outlets that are on 24/7), the QuickVu™ monitor comes on and requests a video signal from the camera. The camera stays on for a pre-determined length of time (default is 30 seconds) and then turns off automatically. You can also turn on the camera with a simple tap of a button on the receiver, so you can back into a parking space, etc. Why Shouldn’t I Buy a Less Expensive Camera? Because QuickVu™ is simply worth the little bit more! We believe the QuickVu Wireless Backup Camera is a great value. The least expensive backup cameras on the market are either poorly made, or they require serious efforts to install (including running wires from the back of the vehicle to the dash). Moderately priced systems still involve significant efforts to install, such as drilling holes in your vehicle, running wires to the reverse light, and splicing into the electrical lines. You could have to pay several hundred dollars just to have your inexpensive camera installed, and you may violate your vehicle manufacturer's warranty by doing so. We designed QuickVu to be easy for just about anyone to install, saving you those high installation costs. So How Much Does the QuickVu™ Wireless Backup Camera Cost? The real question is how much does QuickVu™ SAVE you! The retail price is $299.99 but we have it on sale at $259.99! It is fast, easy to install, durably made and will increase your confidence and safety while you are on the road! What Do People Say About the QuickVu™ Wireless Backup Camera? I wish I had one or these years ago when I had a Camper and had to continually hop in and out of the truck just to see if the hitch lined up with the camper. One time I went too far back and damaged my truck and had a $950.00 repair bill for a tiny dent. I recommend QuickVu™ to correct a blind spot or for anyone who uses a trailer hitch. When my son started driving, I wanted a backup camera for my Suburban. The camera was easy to install on the license plate frame and the video monitor mounted easily on the dashboard. I had a few challenges with the electrical in my truck, but we resolved the problem and it works great. The visibility is good--even at night. I have been very happy with this product. Gave this to my husband and he loves it! Easy to install and the picture is very clear, even at night in parking lots. It comes on when you start your car. I want one for my own SUV! Received as a Christmas gift, and installed 1/6/2015. Works perfectly on a Camper Van about 18 ft. in length. Extremely simple to install. I would definitely purchase another one for second automobile!Great value for the money. They said it will take 5 minutes to install and that is exact the amount of time I spent installing the unit. A lot better than spending $500 on another unit. I've had this back-up camera for about 6 months. We recently purchased a car with a built in back-up camera, so we switched the QuickVu™ camera to another car. Which is one of the great things about this product--it can be switched to another vehicle without much hassle. Having driven both cars for a few months now, I can say that the QuickVu camera functions pretty much the same way as the built in camera. They basically do the exact same thing! ... if you don't have a built-in back-up camera, this is a great, inexpensive alternative! And as a mother, it really gives me peace of mind. Make Sure Your “Back” Is Covered! Order a QuickVu™ Wireless Backup Camera Today! It will make a huge difference in so many ways! You’ll love being able to see if there are animals, children or objects behind your truck or car— and hitching your horse trailer will never be easier! Call and order today and let QuickVu™ have your “back” every time you travel!